My mobile device lived in this locker for 3,960 hours since I began working at the home, farm and auto supply store. Carrying our devices with us while at work is not allowed and that’s fine with me. There is no need for a human to be constantly connected to social media, email and news, especially when engaged with people at a job site or other location in the real world. I don’t suffer from lack of connection. What matters more is the security of my lunch until I eat it. Marauding teens and twenty-somethings have been known to pillage the shared ice box while hungry, eating anything found. The locker resolves that concern. 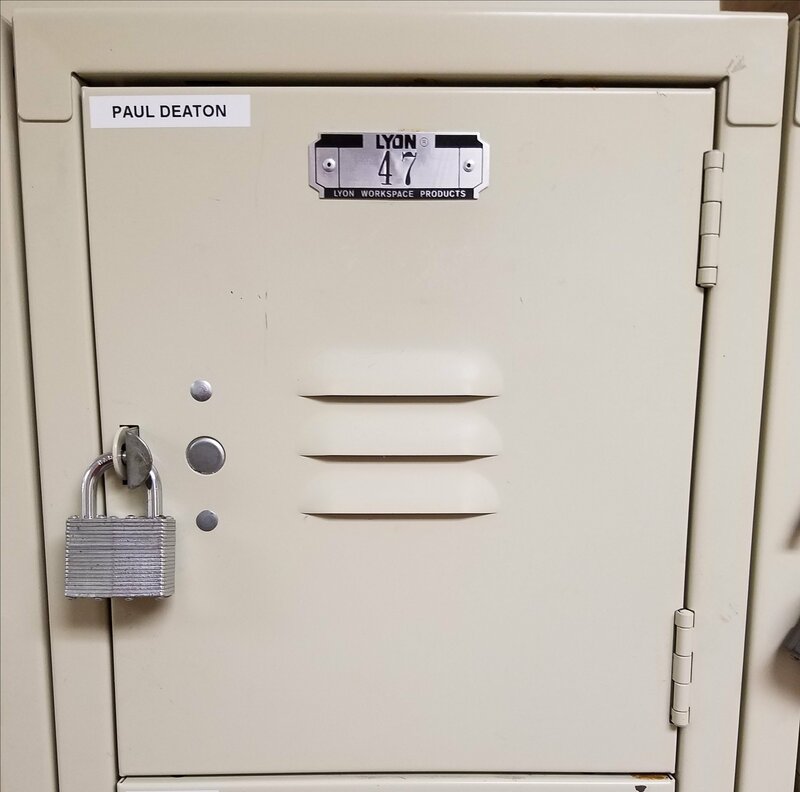 While I’m gone from work, the locker is home to a radio earpiece, ink pen, box cutter, name tag, padlock keys, tape measure, duster, hat, aspirin tablets and a few other work items. Those might disappear if the locker wasn’t locked. It’s a flimsy locker and anyone who wanted to break into it easily could. Suffice it the padlock discourages people from looking inside. I’ve had no issues since I began working there about two years ago. I won’t get the time spent at the home, farm and auto supply store back. I took the job to avoid taking loans for living expenses. I stayed because of the reasonably priced group health insurance plan. It fills the gap between failure to start a viable business after my transportation career and Social Security. Time spent there is fit bookend to my part time high school job in retail. The company I work for now bought the building where I worked almost 50 years ago and opened a store. I hope to visit before long, before fading into the oblivion of an ultra local life writing, gardening and living from a perspective built on the shore of a man-made lake. I won’t need a locker then. This entry was posted in Work Life and tagged sustainability, worklife. Bookmark the permalink.